You'll flip when you taste this homemade Chocolate Pie Crust. I promise. 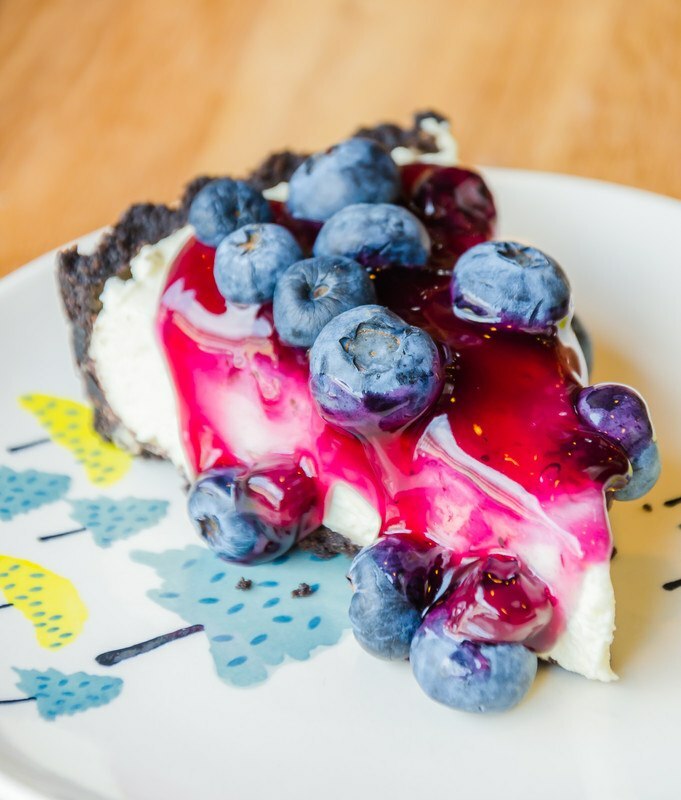 It adds a different twist to my no bake cheesecake that I love. See for yourself below. Fill it with fresh strawberry pie filling, peanut butter pie filling or use it with my chocolate meringue pie. Add the remaining ingredients, seal and shake to mix well. Press into a pie plate. Bake for 5 to 7 minutes or until light brown. Cool and fill. This chocolate pie crust recipe is from the cookbook, "Baking, From My Home to Yours" by Dorie Greenspan. She is so good that I wanted to pass this on to you. Garnish with chocolate shavings and homemade whipped cream. Sift the flour and cocoa powder onto your work surface and make a large well in the center. Pound the butter with a rolling pin to soften it, so it blends easily when it is added to the rest of the dough ingredients. Pout the egg yolks, sugar, salt, vanilla extract and softened butter into the well. Using your fingertips, work all the ingredients in the well together until thoroughly mixed. Gradually draw in the flour and cocoa powder with the pastry scraper, working them into the other ingredients with your fingertips. Continue working the ingredients with your fingertips until coarse crumbs form. Press the dough into a ball. If the dough is sticky, work in a little more flour. Lightly flour the work surface. Blend the dough by pushing it away from you with the heel of your hand. Gather up the dough with a pastry scraper and continue to blend until it is very smooth and peels away from the work surface in one piece; approximately 1 to 2 minutes. Shape the dough into a ball again, wrap it tightly and chill until firm; approximately 30 minutes. Brush the pie plate with melted butter. Lightly flour the work surface and roll out the chilled dough to a round 2 inches larger than the top of the pie plate. Wrap the dough around the rolling pin and drape it over the plate. Gently lift the edge of the dough with the fingertips of one hand and press it well into the bottom of the pie place with the fingertips of the other hand; pressing lightly to seal any cracks. Using a table knife, trim the pastry even with the outer edge of the plate. Pinch the dough to make the edge stand up. With one forefinger under the dough edge, pinch the top of the edge between your other forefinger and them to make a wide scallop. Prick the bottom of the pastry shell with a fork to prevent bubbles from forming when it is baking. Chill the pastry shell until firm; approximately 15 minutes. PREHEAT oven to 400 degrees and place a baking sheet in the oven to heat up. Line the pie shell with the double thickness of foil, pressing it well into the bottom edge. Half-fill the foil with dry beans to weigh it down. Bake on the baking sheet for 12 to 15 minutes. Remove the foil and the beans. Reduce the oven temperature to 350 degrees and continue baking until the bottom of the pastry shell is firm; approximately 5 to 10 minutes longer. Transfer to a wire rack to cool and then fill it up.